Students asked, and we provided! 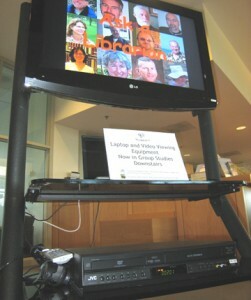 Thanks to Dean Cadoret and others, Armstrong Library group study rooms now have equipment for video and laptop viewing. For computer use, researchers can bring their own laptops or check out a laptop from the Circulation Desk. For videos, a DVD player/VCR is already in the room. This is another outcome based on feedback received from the Post-It note bulletin board Carrie MacFarlane did at Armstrong last year. Carrie and Brendan Owen, Digital Media Intern, will be doing a presentation on this effort next week at The October Conference , Space 2.0 : Small-Scale Library Redesign Projects, at Dartmouth. Nice teamwork, Carrie and Brendan! This entry was posted in LIS Staff Interest and tagged DVD, laptop, LIS, Photos, Research & Instruction, screen, Sep 26 08, VCR, video on September 26, 2008 by Judy Watts. Voter registration materials are available in the Main Library atrium. If you or anyone you know, are not registered to vote in the November elections, stop by to pick up the materials. Thanks to Brenda Ellis and Jean Simmons for getting the materials, Joseph Watson for helping with the display, and Morgan Connor for the brilliant picture. 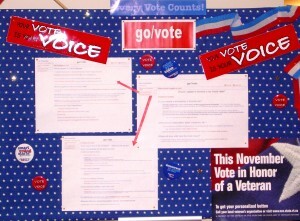 This entry was posted in LIS Staff Interest and tagged elections, registration, Research & Instruction, Sep 26 08, vote, voter on September 26, 2008 by Judy Watts. * In a cooperative effort between the Administrative Systems group, Database Applications and Systems group, the Budget Office and the CCAL office, a new application for student organization budget reports was put into place for the start of fall term (as reported in the recent issue of Unbound). * In conjunction with Karin Hall-Kolts in the office of the Dean of the College, implementing the 4/2 residential life system in the Commons (junior and senior room designations will be tracked with a singular commons code scheme). This entry was posted in LIS Staff Interest and tagged Enterprise Applications, LIS, Sep 26 08 on September 26, 2008 by Marcella Smith. 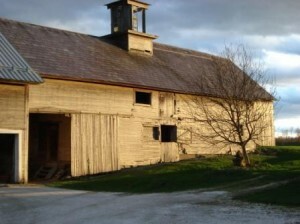 Peter Schilling, head of IT at Amherst, published an interesting index of IT factoids at Academic Commons (a site that I help to run) which the Chronicle picked up on. Look for a similar Midd-centric index coming soon to our magazine. Are the changes Amherst notices also happening here? This entry was posted in LIS Staff Interest and tagged Links, Sep 26 08, students on September 26, 2008 by Michael Roy. With 17 class days in September, Librarians will have presented 53 classes. That’s a rate of 3 per day since the beginning of the academic year. Perhaps you can understand why getting these scheduled into rooms with adequate equipment, e.g., smart classrooms with computers for students has us tearing our hair. First Year Seminars represent the greatest percentage of classes at the beginning of the term. New students need a basic introduction to LIS resources and services. Classes will often be back for in-depth instruction in subject resources when research papers are assigned. Basic technology instruction is included in a large percentage of these classes, introduced either by a Technology Liaison or by the Librarian. Classes that involve intensive use of digital media generally schedule classes separately. Some of that activity will be reported at a later date. This entry was posted in LIS Staff Interest and tagged classes, course, First Year Seminar, FYSE, instruction, Librarians, RefWorks, research, Research & Instruction, Resource Development and Services, Sep 26 08 on September 26, 2008 by Judy Watts. RefWorks has made some significant improvements to its Windows version of Write-N-Cite –version III- – making it possible to edit and add references to formatted papers. Jean Simmons has requested similar updates for Mac users. Jean has attended two online training sessions to learn about this as well as other new features, e.g., switching between versions of W-N-C, importing from RSS feeds, creating bibliographies from materials in several folders with “My List,” working offline, appending attachments to a record. . . . Ask her what you may not know and please sit in on a RefWorks workshop. RefWorks can be helpful to anyone who needs to keep book lists, citations, or bibliographies in order.. Thanks to Brian Foley, LIB 105 already has Write-N-Cite III and Armstrong 161 will have it soon. This entry was posted in LIS Staff Interest and tagged RefWorks Write-N-Cite, Research & Instruction, Sep 26 08, W-N-C on September 26, 2008 by Judy Watts. Thursday, October 2, from 1-2 PM, join us for an Educause Live! Professional Development Event: Web 2.0 for the 21st Century Learner. We’ll be in LIB 221. You can register here. This entry was posted in LIS Staff Interest and tagged Educause, professional development, Research & Instruction, Sep 26 08, Web 2.0 on September 26, 2008 by Judy Watts.